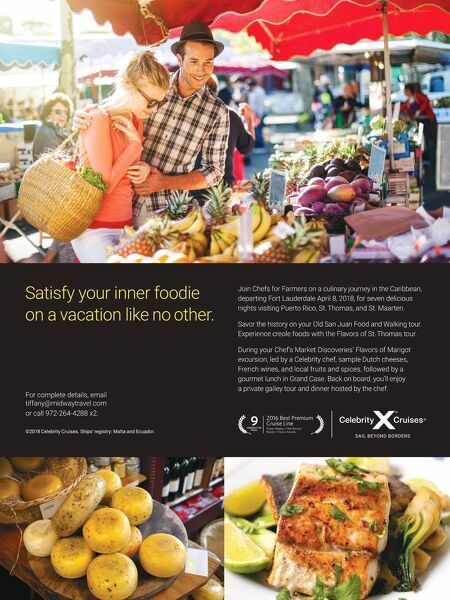 Join Chefs for Farmers on a culinary journey in the Caribbean, departing Fort Lauderdale April 8, 2018, for seven delicious nights visiting Puerto Rico, St. Thomas, and St. Maarten. Savor the history on your Old San Juan Food and Walking tour. Experience creole foods with the Flavors of St. Thomas tour. During your Chef's Market Discoveries' Flavors of Marigot excursion, led by a Celebrity chef, sample Dutch cheeses, French wines, and local fruits and spices, followed by a gourmet lunch in Grand Case. Back on board, you'll enjoy a private galley tour and dinner hosted by the chef. Satisfy your inner foodie on a vacation like no other. For complete details, email tiffany@midwaytravel.com or call 972-264-4288 x2. ©2018 Celebrity Cruises. Ships' registry: Malta and Ecuador.